This amazing gem, done in the early 1970s by William Shatner—fresh off the cult classic Star Trek television series of the 60s—is a highly visual excursion around the world, from Easter Island to Carnac in Brittany to Baalbek in Lebanon to Nan Madol on a remote Pacific Island, Nazca and much more. This made-for-TV documentary, using Swiss and German cinema photographers, explores many ancient mysteries and the concept of gods from outer space. Shatner takes us around the world to astounding archaeological sites, and then shows us impossible artifacts from the past. Finally, Shatner tackles the UFO enigma, including government cover-ups related to UFOs. Rare interviews with figures of the 1960s and 70s including Anna Mitchell-Hedges, former owner of the famous crystal skull. It’s Captain Kirk at his best revealing the fascinating “Mysteries of the Gods.” A surprisingly well-done lost documentary produced at the peak of the “Chariots of the Gods” period that has led us to the popular Ancient Aliens TV series. Includes trailers and extras. 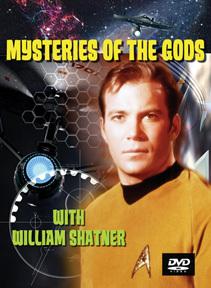 MYSTERIES OF THE GODS DVD With William Shatner. 95 Minutes. DVD in Box. Extras. Plays in all regions of the World, like all of our DVDs.